It was a classic misdirection. With an 0-2 count on Miguel Cabrera to open the 10th inning on Saturday, Fernando Rodney sent a 100-mph pitch so outside the strike zone that catcher Jose Molina could not get a glove on it. Wildness thus established, he followed it up with a pitch near Cabrera’s head. In many respects, the pitch was perfectly placed. It tailed in at the last moment, but was easily trackable by the batter and was never in danger of hitting him. Cabrera leaned back to avoid it, but it would not have made contact even had he remained still. The strategy was also sound. The previous day, Cabrera had homered twice (and didn’t help matters by celebrating that game’s final out by performing what appeared to be an imitation of Rodney’s archer pose, which the closer strikes following saves). Cabrera leads the major leagues in batting average, RBIs and OPS, and is second in home runs. It was without doubt in Rodney’s best interest to make him as uncomfortable at the plate as possible. And it worked. Cabrera flailed at the next pitch, a down-and-in changeup, for strike three. The pitcher was obviously not trying to hit Cabrera during extra innings of a 3-3 game. Even if he was, it is given wisdom that such a strike is far easier to execute when aiming at the torso than at the head, which is a smaller and more maneuverable target. Much more likely was that Rodney wanted to crimp Cabrera’s style—get him out of the dangerous space in which he’s resided all season—and either A) misjudged the height of his inside pitch, or B) didn’t care. 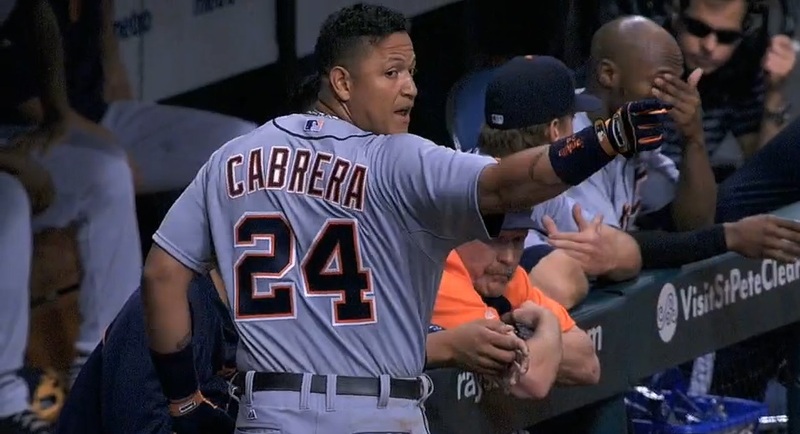 Cabrera didn’t comment afterward, but his manager, Jim Leyland, did. It caused problems for Ben Zobrist on Sunday, when, with two outs and nobody on base in the first inning, Tigers starter Rick Porcello drilled him in the back with a 94-mph fastball. It was intentional and it was expected. Plate ump Vic Carapazza quickly warned both benches. Cabrera got his own measure of revenge three innings later, when he crushed a homer into the Rays Touch Tank—only the second such blast in the ballpark’s history. 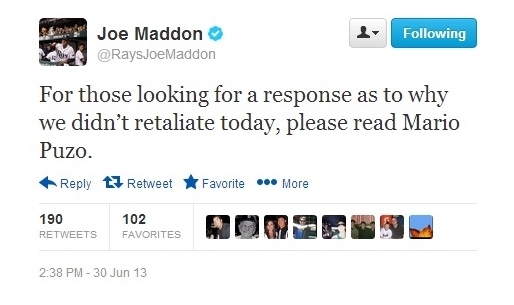 To gauge it by the wisdom of the author of The Godfather, the Rays, apparently, will not forget this slight. Considering that they won’t face Detroit until next season (or in the playoffs), however, their memories will have to hold for a while. Listening to the announcers, they seemed to think that a brush back pitch shouldn’t have equaled a hit batsmen. In general, I think that’s true but when the brush back was too a guy of Cabrera’s caliber, is seems a HBP was warranted. Hope they meet in the playoffs. It’s a message: Cabrera’s home run ball sleeps with the fishes.